In all cases the highest resolution versions of photographs and documents available will be used. Some of these are too large to use on this web site. * The Spirits of Gallipoli project holds photographs of over 25,000 identified, First World War soldiers. The Project also has photographs of many headstones and memorials on the Western Front. These will be included on any Honour Your Anzac CD. Many thanks for the CD regarding my soldier. What a lot of info to wade through, sure to keep me busy for a while. Well worth the cost. The soldier concerned served at Gallipoli, was at the landing and throughout the campaign. He served and survived the Western Front. He put his age down and served in WW2, was a POW and eventually returned home - a true Anzac Hero! 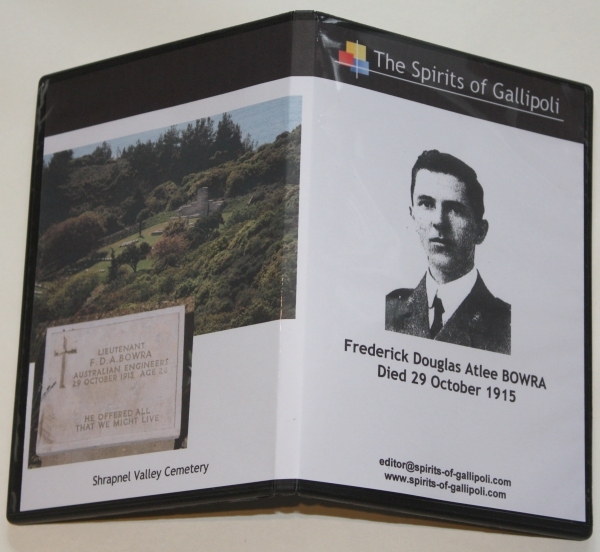 Honour Your Anzac CDs can be produced for any soldier who served. They may, or may not, have served at Gallipoli, they may have returned to Australia, they may not have survived the Western Front. The information available will vary from soldier to soldier. * CDs will also contain "Virtual Tours" of both Gallipoli and the Western Front today. Each CD comes in its own, personalised, case. Soldier's Name & Service No. Buy CDs for ALL the family! with the full name and service number for your soldier, together with any other relevant information. Should you have any family photos or information that you would like included in the CD, please send that as well, either by email, or mail. All items will be returned. For problems or questions regarding this Web site contact [WebManager@spirits-of-gallipoli.com].